Playa del Carmen, an overcrowded touristic area on the world famous Rivera Maya coast. This resort town offers beautiful beaches, fine shopping and dining and a lively ambiance. It can be reached with only 45 minutes by car from Cancun airport. To recommend a time to visit Playa del Carmen is very complex, all depends on what kind of traveller you are. If you are looking for some sunny and lazy days at the beach, this is your place to be, you have plenty of resorts directly at the beach. 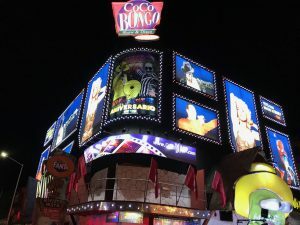 If you are after party, this is also your town, Playa del Carmen is also known for its parties and huge pubs. But, if you are travelling through Mexico, like us, this is just a place to have seen and keep exploring. 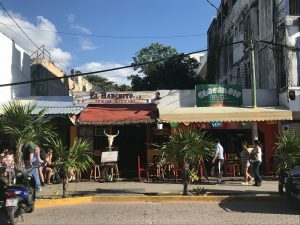 We found a lot of people travelling through Mexico and almost all agreed on this, Playa del Carmen is nice to see but nothing compared to Tulum if you are more into relax and less crowded beaches. So we kept this information in mind. You can take a private Taxi, directly outside of the airport, there will be plenty of them waiting for you. The cheapest and good option is to take the ADO bus to Playa del Carmen, you can buy the tickets directly at the airport at the ADO counter. It takes about 1 hour and it cost approximately 190 pesos. 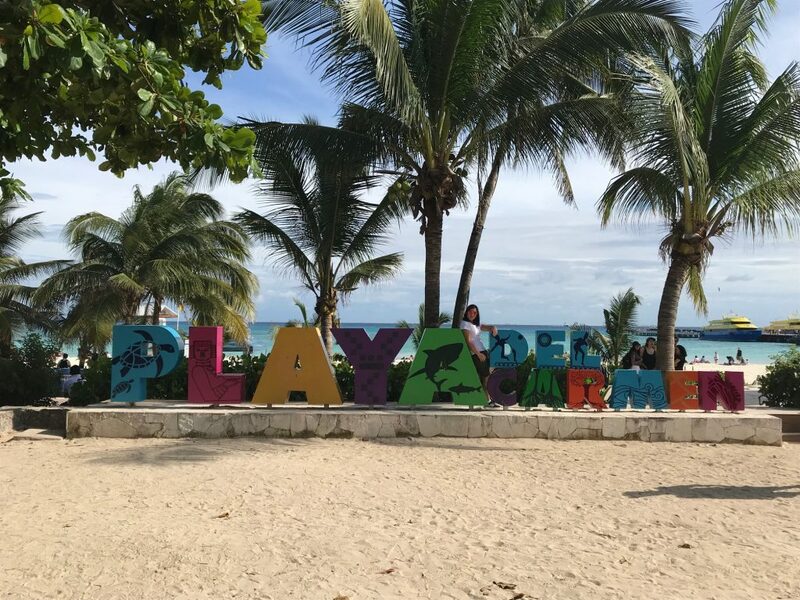 Playa del Carmen, also known as “Playa” was a small fishing town which has developed into a touristic town with an international flavour. It has one main street, the pedestrian street called 5th Avenue, “Quinta Avenida” in Spanish. It has plenty of restaurants, shops, bars and entertainment for everyone. This Avenue is lined with the beach. Playa del Carmen is famous all over the world for its huge clubs, most are located at on 12th Street between 10th Avenue and the beach. If you are not into clubbing, don´t worry, there are options for everyone, you will also find beach bars, which they are a bit quieter and also live music in many bars and restaurants at the city centre. 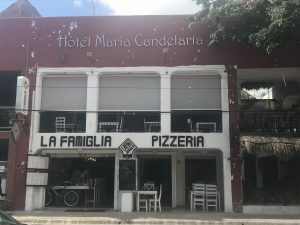 Tips where to sleep, where to eat and drink and what to see in Playa del Carmen. 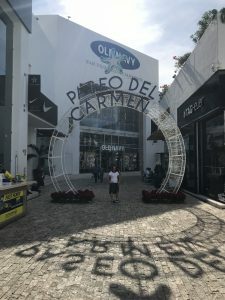 Before you decide for a Hotel in Playa del Carmen you need to know what you want, all-inclusive resorts, then maybe look at Playacar or just hotel, also you need to know if you want to stay at the city centre or on the coast. We took the decision of staying a bit out of city centre, for two reasons, the price and you need to know that at night it can be loud if you are not into party. 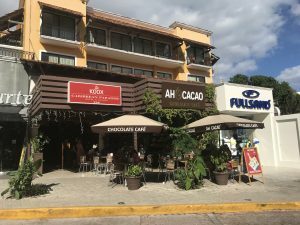 In Playa del Carmen you have many opportunities to eat out, so reconsider to take the all-inclusive option. You will find budget options and also really fancy restaurants. El Voilà, for breakfast or at any time, enjoy the French sandwiches and for the fresh smoothies. El Ranchito, for real mexican food prepared from locals. La Famiglia, for some good Italian food. Ah Cacao for breakfast with really good coffee. Visit and swim in a Cenote around Playa del Carmen, is one of the most amazing experiences you will take part. A Cenote is a swimming hole formed thousands years ago by the collapse of porous limestone bedrock. You can find some along the Rivera Maya´s Federal 307 Highway, reachable with a colectivo. If you need a change from beaching you could take day trip to Valladolid, a colonial town. We hope you like our Playa del Carmen Born Backpacker Guide, follow us there is more to come! Next stop for us was the island of Cozumel, we recommend you to read our insider tips. Don´t hesitate to contact us if you need more information!